Japanese drugstore Welcia-BHG launched its flagship store at BHG Bugis in early November 2017, making its debut in Singapore. 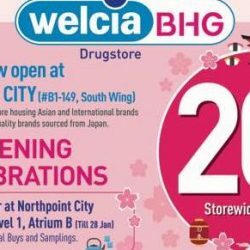 Welcia-BHG is a joint venture between Japan’s top pharmacy and drugstore, Welcia and BHG Holdings Pte Ltd. Welcia-BHG will set the stage for a fresh and distinctive experience with a strong focus on Japan imports and Japanese brands, some of which are exclusive to Welcia-BHG in Singapore. Enjoy Welcia-BHG's Northpoint opening celebrations! 20% off till Sunday. Check out more great deals instore at both Bugis & Northpoint. Plus, samplings and opening specials at the Atrium at Northpoint City, South Wing L1.